As I practiced the Knowledge more and more, it became visibly clear to me that this was the way I would be able to answer all the questions I had been living with for so long. I was learning what in fact was the one reality, what was the right role for my mind to play, what kind of action would be the best for my body if I wanted to use it to its fullest potentiality. And most important, I learned how the poor tired leaders all over the world could stop playing their games of chess with us. My parents were asked about me, and they stated what they saw: that this organization had put on a very impressive festival in New Delhi, well-controlled by respectable young- people from around the world calling themselves the World Peace Corps, and were very impressed by the dedication, energy, love, and joy of Maharaj Ji's followers. Now I am again being diplomatic, but the job has been immensely simplified, because all I have to do is to be honest. Diplomacy is now to open doors rather than shut them, to speak the language that people can understand, so that the fine world of devotion, of trust and openness, can become a home for humanity. "greater than God - He is the Guru. Without the Guru, you cannot receive God … God is energy, infinite and omnipotent. Guru Maharaj Ji enables us to realize that energy and take full advantage of it. It's like there is the knowledge which is the water, and the Guru is the cup with which to drink the water and ingest the knowledge." Why not drink from the faucet? " Impossible. The mind, the ego, has stopped us from even realizing we're thirsty." She was appointed Press Secretary to the Millenium '73 festival that Guru Maharaj Ji (Prem Rawat) called "the most holy and significant event in human history." She did her job so well that she was singled out by Michael Shamberg, the producer of the TVTV special, Lord of the Universe, as the "only one appealing enough to want to be friends with away from the madness." He considered her the only member of the DLM hierarchy not on a "power trip" and that "99% of the Premies were genetic defects in their other life" which either makes her truly exceptional or him a sucker for upper-class young ladies. She was written about in Ramparts magazine where she demonstrated a true talent for speaking in Divine Light Mission clichés"
Diana Stone, 26, is a very special premie who has experienced much darshan. Her father was in the diplomatic corps, and she has been all over the world and majored in psychology in college. While her father was acting ambassador to India, she first discovered the Holy Family and received Knowledge. She reflects an innate warmth and intelligence that attracts immediate attention. She describes her leader as "the true dispeller of darkness and revealer of light." 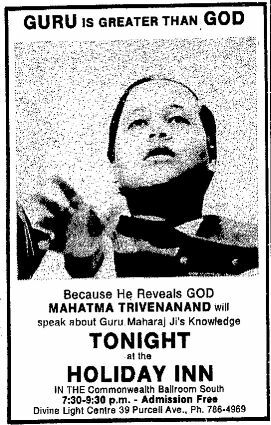 Rennie and many other premies had assured me that the Satguru was God Himself. Diana Stone went beyond them, saying that Maharaj Ji is "greater than God - He is the Guru. Without the Guru, you cannot receive God … God is energy, infinite and omnipotent. Guru Maharaj Ji enables us to realize that energy and take full advantage of it. It's like there is the knowledge which is the water, and the Guru is the cup with which to drink the water and ingest the knowledge." Why not drink from the faucet? "Impossible. The mind, the ego, has stopped us from even realizing we're thirsty." Stone was instrumental in making Sophia Collier a writer for DLM and because of that Collier later wrote her DLM memoire "Soul Rush." Some of the premies at the festival offices put out a small newsletter about the activities and progress of the festival plans. To spruce up this Xeroxed rag, occasionally they included a story or poem. In the lull between "wash" and "spin" I couldn't resist writing about the mat and the people I met there. After a few of my vignettes had been published, Diana Stone, a premie who was coordinating some of the PR for the festival, called me. "You're an artist," she told me. "You should come up here and work with me. Write stuff for the Divine Times, for our leaflets." Boston Debs See The Light was the headline in the society section of the Boston Globe the day I arrived in Boston. Poss, my old friend from Maine, showed me the newspaper at the Divine Sales store, a secondhand outlet he ran for the mission in Boston. "This place is really some scene," I said, noticing that Diana Stone, the woman who rescued me from the laundromat in Houston, was coming down the street. "Wow, it's a celebrity," Poss said, pointing out that Diana, originally from Boston, was one of the "debs" mentioned in the Globe's article. "What are you doing in town?" Diana and I asked each other at the same time. We swapped stories. She was here as part of a fund-raising tour, "visiting millionaires." Diana had an almost inbred feel for the business of tact and cultured salesmanship. Her father was a high-ranking official in the U.S. State Department. Throughout her childhood, Diana had traveled with her family to many parts of the world while her father represented the United States. When she joined DLM, she was living in India with her parents. News of her conversion spread quickly. "It didn't take long before all of the diplomats in New Delhi knew that the daughter of the American chargé d'affaires was into some young guru," Diana related. "An Italian told me, 'Everyone knows about Diana.' Even the Ambassador from Mongolia indicated to me one day in passing he'd been keeping up on my activities. It showed his intelligence officers were in good order." She was handling the press at the "Peace Flight '77" festival in Montreal. "There is no doctrine about how one relates to Maharaj Ji," said Diana Stone, Boston, who lives in the one of few ashrams - communal houses - still maintained by Divine Light Mission. "It is totally a personal one." "The people who are here now are very solid," Miss Stone said "Everyone has grown." 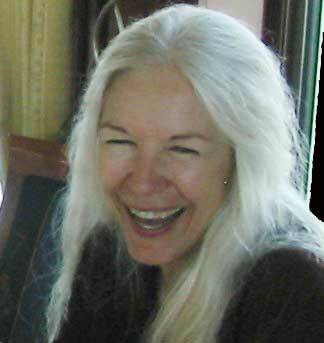 "You make yourself available to Maharaj Ji by moving into an ashram," said Diana Stone. Despite significant health problems, Ms Stone remained as a full-time ashram resident until Rawat unilaterally closed the ashrams in 1983. As a member of a wealthy family this would not have been such a trial for her as it was for the hundreds of other who were ejected after up to 12 years of their lives dedicated to working for Rawat with no university education, no career, no capital and fractured family ties. She continued her practice of Prem Rawat's (Maharaji) Knowledge until 2003 when she was introduced to the teachings of Irmansyah Effendi the Grand Master and Founder of Reiki Tummo, which she now believes completely fulfil her. 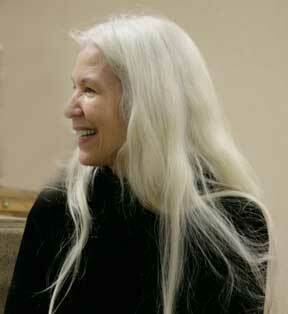 In her later biographical writings she maintains an exceptionally positive view of her life's travails. 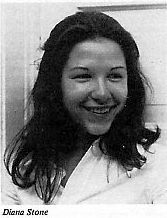 She characterises Rawat's Knowledge as a mental discipline and by comparison with Reiko Tummo a flawed method of finding peace although she does not reveal the name of her former, so-called "meditation teacher" who she previously had publicised as "Greater than God" and makes no overt connection between her unsatisfied life, depression and poor health and Rawat's simplistic "Knowledge", ignorance, arrogance and materialistic opulence. I believe that any informed and sympathetic person reading between her lines will make the connection.